I want to submit a novel manuscript to a small press in the US and their guidelines say "indented, not tabbed." What's the difference? Usually I just hit the tab key once. Should I be doing something else? I have Word Starter 2010, and I can't see any distinction between "indent" and "tab." How do I make sure I'm indenting and not tabbing? If I'm tabbing, how do I change it to indent? This is an excellent question, and I'm sure the cause of much confusion among word-processing novices. There is in fact a distinction between tabbing and indentingor rather, it might be more accurate to say that tabbing is only one way to indent a paragraph. 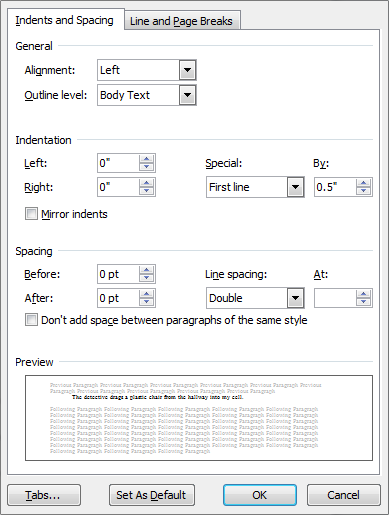 I will try to explain a method for indenting paragraphs that makes your document more portable* and easier for your publisher to use. Back in the Stone Age, when we still used typewriters, there were two ways to indent a paragraph. You could hit the space bar five times at the start of your first line, or you could set up a tab stop half an inch in from your left margin and just hit the tab key once. "Tab" is short for "tabular," because tab stops were useful for helping a typist arrange figures in tables. Click the manuscript page below to see William Shunn's original guide to formatting your short story or novel the way professionals do. Copyright © 1995-2015 by William Shunn.